Hey there! 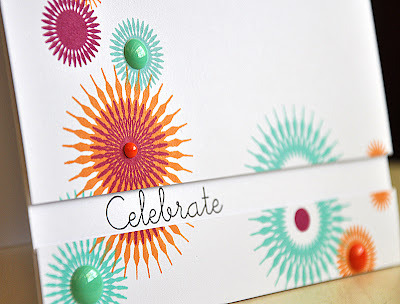 Thanks for joining me for day two of the Papertrey Ink October countdown. I'm back today to bring you more of my new set... Snowflake Flurries and from the looks of it, it sounds as if some of you are as excited about this set as I am. Also, this month, I'm excited to bring you a couple additional items... 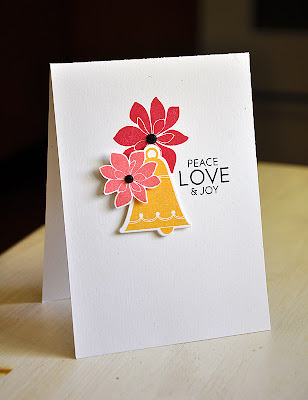 Think Big Favorites #21 (a stamp set of super-sized sentiments from Bells & Boughs) and Bells & Boughs Bloomers dies (a set of dies that coordinate perfectly with the blooms from Bells & Boughs). More on these two items in a bit. 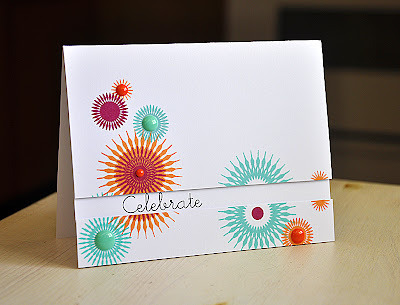 I wanted to focus on additional uses for the medallion images included in this set, by creating a colorful birthday card. I stamped the snowflake medallions in a color combo of Hero Arts Orange Soda, Tide Pool and Raspberry Jam inks, onto a cardstock block. Then cut the panel in two and attached to a card base using dimensional adhesive. The sentiment was stamped before hand. 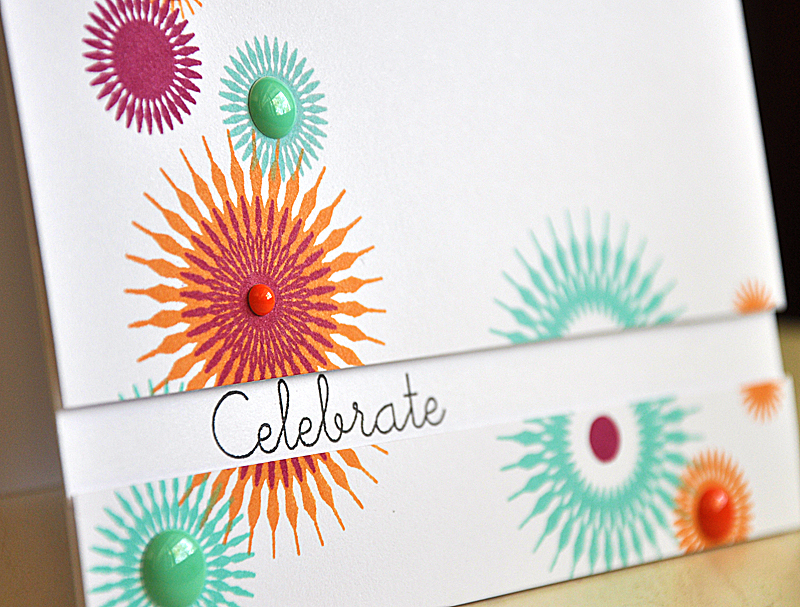 Finished the card off with a few fun enamel dots. 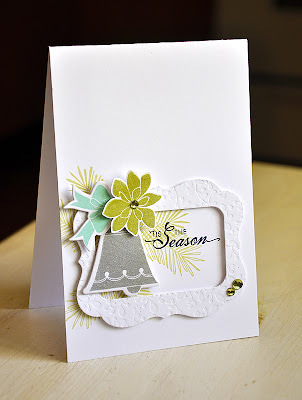 Up next, I've pulled out my Bells & Boughs stamp set and paired it with the other two new items I mentioned above. I stamped the boughs and super sized sentiment onto the card base. 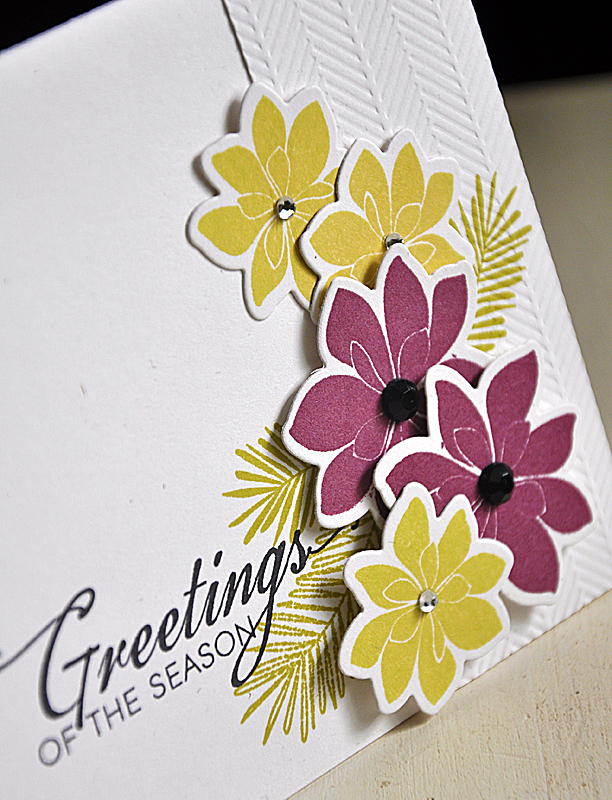 Then quickly die cut and stamped the blossoms and attached them with dimensional adhesive. 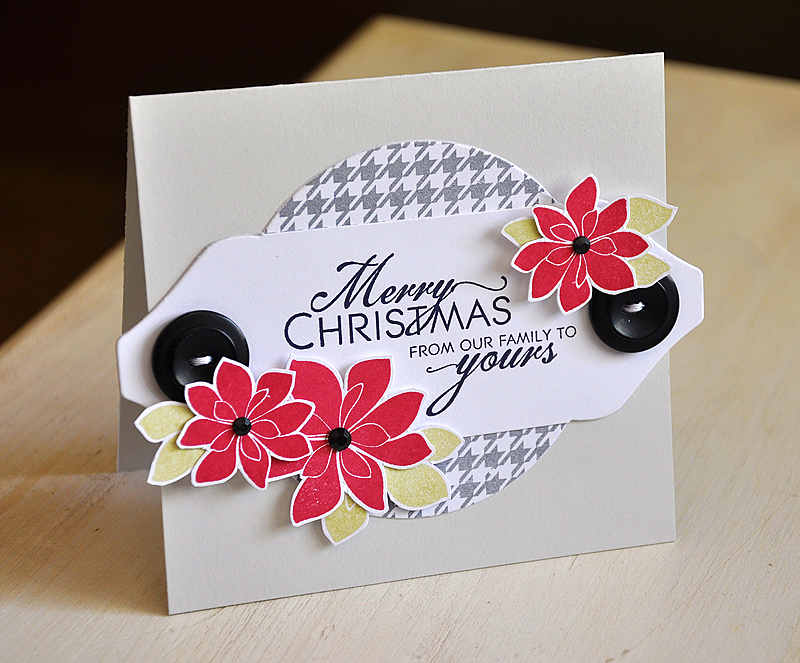 Finished the card off with a few rhinestones. That's it from me today. Now, be sure to visit Nichole Heady & Jessica Witty for peeks at today's featured sets. Also, Dawn McVey, Heather Nichols, Melissa Bickford and Erin Lincoln have peeks to share with you of their newest sets for the month. CAS with a die cut or two perfectly placed makes for the ideal card in my opinion. You have provided some of the best options I have seen for combining them in unique and versatile ways. Thanks, Maile! Love the colors! And please explain to me WHY I don't yet have the Bells and Boughs set! LOL! Awesome cards. Maile, man oh man I love your use of colour! Your samples are absolutely delicious, particularly the new sample using Bells & Boughs. The white twill ribbon on the white cardstock is just brilliant. I LOVE looking at your cards, whether it's here or in a publication. I see something new and fresh every single time. These are beautiful, Maile! Loving your color combos on each one!! Bells and Boughs is one of my all-time favorite sets, so I am thrilled to see dies for the flowers and larger versions of the sentiments. 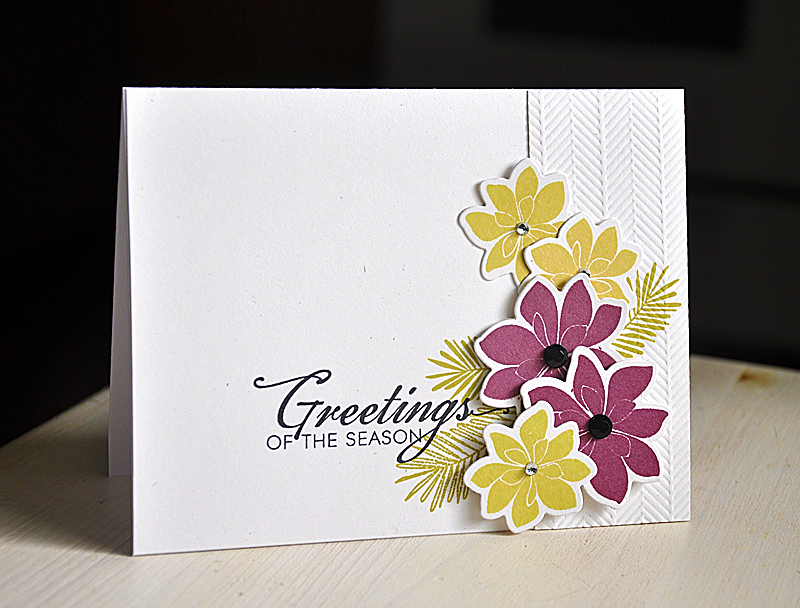 The flowers work year-round, and the dies will make that so much easier. Thanks for reminding us of some of your great cards from before! I'm thinking Snowflake Flurries will make great fireworks. I love multi-purpose. Thanks. Maile, your cards are always so amazing. I love each and every one :) TFS your bright and bold creations with us! That second card is a show stopper! LOVE the first card Maile. It is AMAZING! Such an amazing color scheme too! 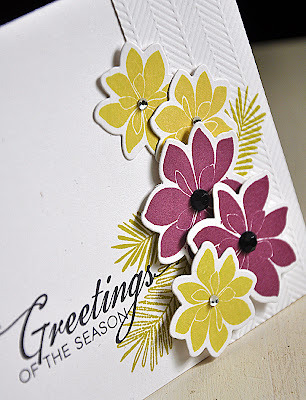 I love the cluster of flowers on the 2nd card...so pretty! The 3rd card is lovely too! Love the 4th one...so CAS, but stunning! The 5th on is lovely too! 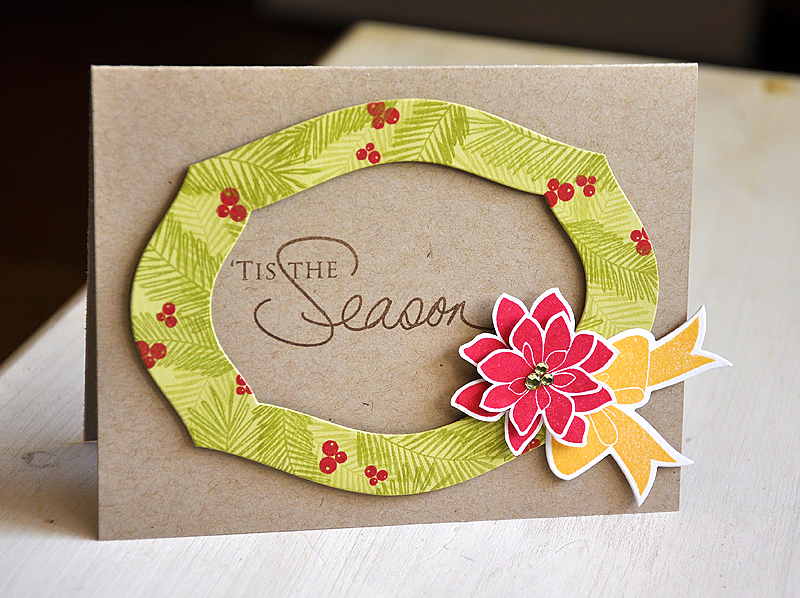 And the 6th card is so pretty and trendy! Love the houndstooth!